The Caldera Rim in Yellowstone National Park, Wyoming, is 40 miles in diameter. 645,000 years ago, a “super volcano” blew out so much magma that the land collapsed downward a few thousand feet, creating the caldera. The Norris geothermal region marked with a red star has periodically had sections closed because of intense heating from below ground. Graphic courtesy the U. S. Geological Service. I went back to the United States Geological Survey office in Menlo Park, California, where Jacob Lowenstern, Ph.D., is the Scientist-In-Charge of the Yellowstone Volcano Observatory. He and I had talked at the end of August about changes this summer in the Norris geothermal system at Yellowstone in which some trails were closed because surface temperatures exceeded 200 degrees Fahrenheit due to increased boiling water bubbling up from below. This week, I read the e-mail to him and asked if there was any continuing evidence of increasing pressures and temperatures at Yellowstone Park. Jacob Lowenstern, Ph.D., Scientist-In-Charge, Yellowstone Volcano Observatory, U. S. Geological Survey, Menlo Park, California: “There are two different press releases by the National Park Service about the Norris geothermal system. There were some changes. There is an area with some dead trees. I don’t think I saw any dead animals when I was there. It’s not changing at this time. It changed in July and has pretty much stayed the same ever since. Norris Geyser Basin, Yellowstone National Park. Photograph courtesy USGS. There was increased boiling that sort of spread onto the area where the trail is so the ground temperatures are very high in some areas. There has been release of thermal water up to the surface in some areas. So there are a few new features and once again, those features formed in late July and they haven’t changed since then. IS IT THE HOT WATER THAT’S BOILING TO THE SURFACE IN MUD THAT IS KILLING THE TREES? Yes, there is increased flow of hot water from the underground to the surface. it’s actually increased heat. There is more boiling than normal. The actual amount of flow of water out of the ground, we don’t know if that has increased. It probably has not. WHAT ABOUT EARTHQUAKES BECOMING A DAILY OCCURRENCE? Seismic events, earthquakes at Yellowstone, are lower than normal at this time and have been for a couple of months. Yellowstone has a lot of very small earthquakes. It’s an active area. But again, there’s no indication that things have changed or increased in the last few weeks to few months. WHAT IS YOUR PERSPECTIVE ON A CONCEPT THAT IS BEING KICKED AROUND ON THE INTERNET OF A POTENTIAL SUPER VOLCANO ERUPTING IN YELLOWSTONE? The periodicity of super volcanic eruptions at Yellowstone have been 2 million years ago; 1.3 million years ago; and 630,000 years ago. Graphic courtesy U. S. Geological Survey. The Yellowstone area has been host to some of the largest volcanic eruptions on earth. They were a long time ago. There have been about three of them, and the most recent one was 640,000 years ago. 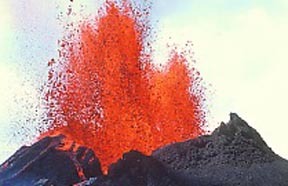 Since that time, there have been about 30 more eruptions, most of them much smaller, and causing much less potential damage than the so-called super volcano event. It’s always possible that there can be more volcanic activity at Yellowstone and that’s why there is a Yellowstone Volcano Observatory. But the probability that that event is going to happen any time soon is exceedingly small. There is no reason to believe at this time that there is any heightened chance of a volcanic eruption at Yellowstone. Hawaiian magma eruption. Photograph by J.D. Griggs. WHAT IS THE DIFFERENCE BETWEEN A NORMAL VOLCANO AND A SUPER VOLCANO? I think what they mean is that the amount of magma that leaves the volcano during the eruption is much, much larger than a typical volcanic eruption such as in Hawaii or Mount St. Helens, or some of the ones we’ve seen over the past few decades. (Super volcanoes) are really large events and they form what we call calderas where the ground actually sinks down because there is so much magma removed from beneath the ground and there’s a big hole that is left. 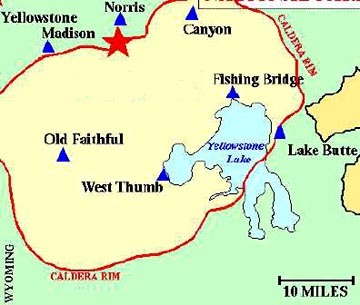 The one at Yellowstone is on the order of 40 miles across. It would be a few thousand feet. A FEW THOUSAND FEET DEEP? Yes. Similar to what you can see at Crater Lake, Oregon, but on a larger scale. That sort of thing does happen. There are several similar kinds of caldera systems around the world. Yellowstone is not the only one. These events do happen, but they are very infrequent. IF I’M UNDERSTANDING, THERE WOULD BE A GIGANTIC ERUPTION OF MAGMA AND THE WHOLE LAND 50 MILES ACROSS SANK? IF THAT HAPPENED AGAIN TODAY, WOULD THE SAME AREA THAT SUNK, SINK LOWER? Possibly. We don’t know exactly what area would be the location for the caldera. It would be somewhere in and around Yellowstone, if it happened at Yellowstone. But again, it’s a very remote possibility that this will happen any time soon, if ever. IF THERE WAS A SUPER VOLCANO AND ALL OF THIS MAGMA BEGAN ERUPTING, WOULD THERE BE A GIGANTIC SOUND ASSOCIATED WITH ALL THIS? Yes, I’m sure you would hear it from hundreds of miles away. WHAT WOULD PEOPLE BE HEARING? They would be hearing explosions essentially. EXPLOSIONS FROM THE EARTH SPEWING OUT THE MAGMA? WHEN YOU SAY HUNDREDS OF MILES, THINKING OF WYOMING, WOULD PEOPLE IN SAY WASHINGTON STATE ON THE WEST AND HOW FAR EAST WOULD PEOPLE HEAR? I’m not an expert and couldn’t tell you how far people could hear it. IS THERE ANY EVIDENCE IN OUR GEOLOGICAL STUDIES TO SUGGEST WHAT THE FREQUENCY MIGHT BE OF A SUPER VOLCANO LIKE THIS IN YELLOWSTONE? Well, there have been three of them and they occurred 2 million years ago; around 1.2 million years ago; and around 640,000 years ago. so, they’ve occurred on the order of every 600,000 to 700,000 years. But there is no reason for us to know that that means anything or that conditions have not stayed ­ we don’t know they are going to occur that often every time. BUT IF IT DID, THEN WE WOULD START BEING IN THE WINDOW OF TIME IN WHICH THERE COULD BE ANOTHER SUPER VOLCANIC EVENT? WE WOULD BE IN SUCH A WINDOW? Within 100,000 years or so. Again, these things don’t happen very often. Human civilization has never seen one in historic times, but even far longer than that. 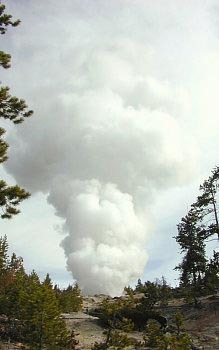 IN SUMMARY, THESE REPORTS THAT ARE BEING SPREAD ON RUMORMILLNEWS.COM AND OTHERS ABOUT A SUPER VOLCANO GETTING READY TO BLOW UP IN YELLOWSTONE PARK ­ WHAT’S YOUR BOTTOM LINE RESPONSE? Dr. Lowenstern says that he is confident that the U. S. Geological Survey has enough seismic and other monitors spread throughout Yellowstone Park to give plenty of warning about major seismic and temperature changes.